Well, I’ll be: Master System box art that isn’t the worst ever. 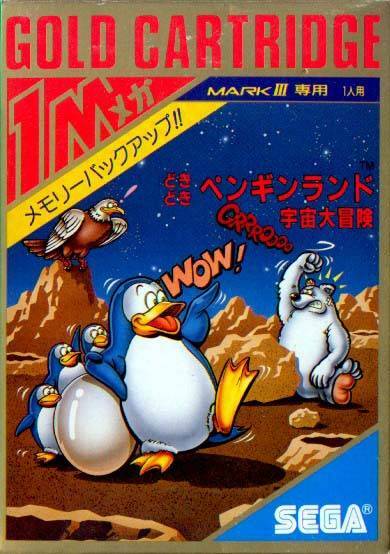 Half Lode Runner and half Antarctic caper, the SG-1000 classic Doki Doki Penguin Land showed that Sega had the ability to create quality puzzle games that wouldn’t have worked within the arcade. The game was a coup for the ailing console in 1985, and while I doubt it was a financial success, Sega saw enough potential in the game to turn it into a series that spanned from the SG-1000 to the Saturn. Penguin Land is considered the sequel, though I use the term loosely. The game is more of a honed reboot for people who never played the original (which, if we’re honest, was probably 99% of Master System owners). It recycles some of the original game’s puzzles and brings them into sharper 8-bit definition, increases the number of puzzles from 30 to 50, and provides a level editor for aspiring developers. 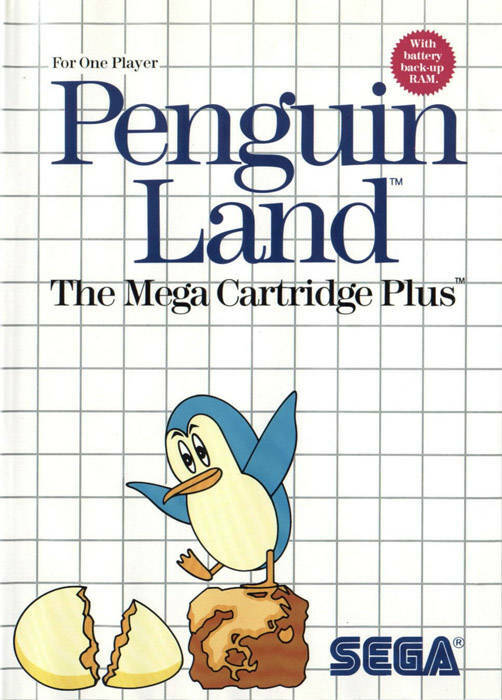 This makes Penguin Land the quintessential version of the two games and the perfect introduction to one of Sega’s strangest series. 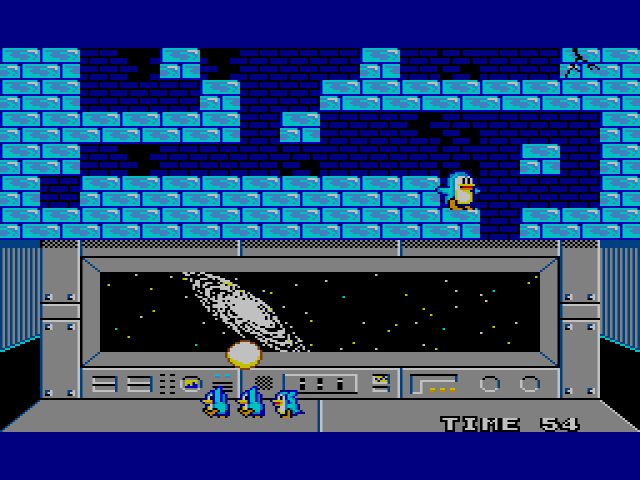 You guide a penguin named Mission Commander Overbite and a penguin egg down several levels of ice and brick to a spaceship at the bottom of a large cavern (that doesn’t make sense, I know, but nobody plays retro games for their realistic storytelling). Since the egg can be cracked if even a whisper of wind blows across its thin shell, it must be guided down with the greatest of care. Pressing ‘Start’ will allow you to scroll down through the level and get a feel for the cavern’s nooks and crannies. This way, you can map your path downwards and move accordingly. 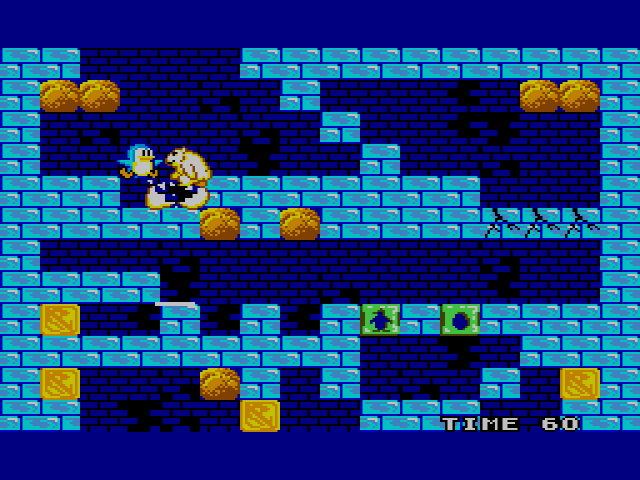 Commander Overbite pushes the egg along with his adorable flappers, and moves the egg down levels by digging through ice a la Lode Runner. There are more than just ice bricks in these underground caverns, however. Gold bricks can not be moved, while brown bricks can only be shifted if there are open spots next to them. Certain ice bricks are already cracked, and if the egg lands on them, it will fall down to the next level. The game provides a white line under your egg that tells you the distance your egg can fall without getting cracked – usually about three spaces downward from your current position. If the white line and the bricks below are in alignment, your egg won’t crack, but if the line is hanging in the air, the egg will crack if dropped. The polar bears return from Doki Doki Penguin Land, and they’re far more aggressive here. In the previous game, they would bat the egg around for awhile before it would break, giving the penguin time to rescue the egg. In Penguin Land, however, the bears will break the egg with one hit. There’s also an albatross who will crack the egg if he appears on-screen – ’cause he’s an albatross and egg-crackin’ is what they do. If you’ve ever played any entry in the Lode Runner or other action puzzle games like Lolo, you’ve probably noticed that the genre generally encourages you to take your time. Not so with Penguin Land. The inclusion of a 99-second time limit per level gives your penguin buns added incentive to move the egg down at a fevered pace. This makes the pause-and-scroll feature all the more useful, as later levels will practically force you to plan a route if you hope to make it out of the level, egg intact. Unfortunately, if you trap the egg in a crevice that it can’t be moved from, your only option is to step on it and lose a life. There is no option to restart the level from the beginning, and there’s also no password feature. 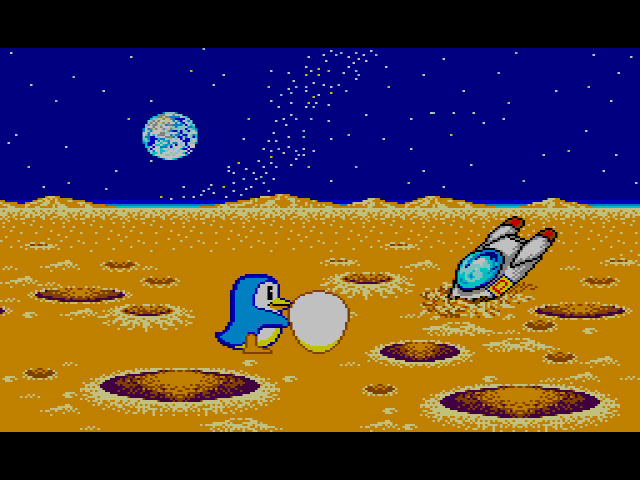 Sega generously provides the ability to start from levels 1 through 30 at the menu screen, but if you want to play past level 30, you’ll have to guide that egg with the greatest of ease and the swiftest of flippers. Your little penguin helpers are adorable. Part of Penguin Land‘s appeal is that the levels can be tackled in a variety of different ways. Will you take the egg through the polar bear haven, with hopes that you’ll reach the end faster? Or will you dig through the ice methodically and avoid any egg-cracking drops? The levels are brilliantly built, and Sega obviously spent a good amount of time thinking them through. For those of us with a limited mathematical mindset, Sega’s ingenuity makes the level editor all the more overwhelming. In the editor, you’re able to use many of the same elements from the original levels, and save up to fifteen of your creations, which is great (battery backup, for the win). But unless your mind naturally thinks in terms of puzzle-building, I can’t imagine too many gamers will build a level that compares with the ones found in the game. I wouldn’t even know where to begin in designing a level like this. 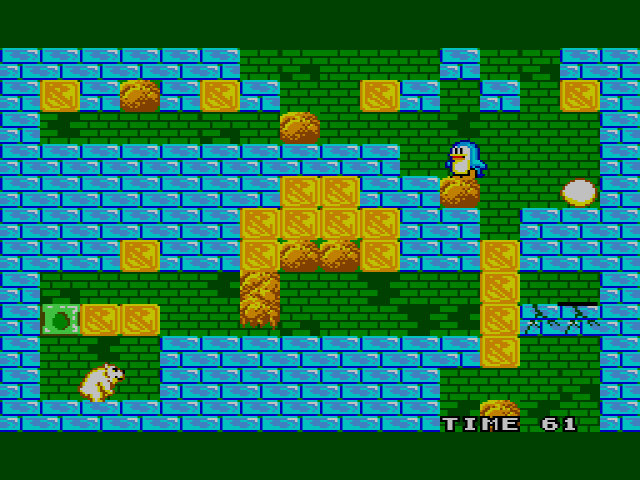 Puzzle games on the Master System are few and far between, so it’s a good thing that Penguin Land is so enjoyable. The difficulty is perfect: challenging enough so that you won’t beat the entire game in a couple hours, approachable enough for you not to get pissed and wish a pox on all penguins, both living and cartoon. If you’re an appreciator of fun and wish to explore one of Sega’s more underrated entries, you owe it to yourself to drop in on Penguin Land. Mission Commander Overbite – I love Japanese titles. It’s certainly better than Will Smith’s “Cypher Rage” in After Earth.